More new releases recently including today’s fare: electric new Brad Mehldau and drummer Rudy Royston’s long-time-coming debut as leader. In the near future, look out for reviews of a new John Zorn album with the guitar driven band Abraxas and a more straight ahead, sax heavy release from Seamus Blake and Chris Cheek. It’s hard to imagine a set of more dissimilar albums; in instrumentation, in feel and in background they are all very different. Yet I think taken together they are a good indication of the state of the music, each showcasing high quality musicianship in its own unique way. 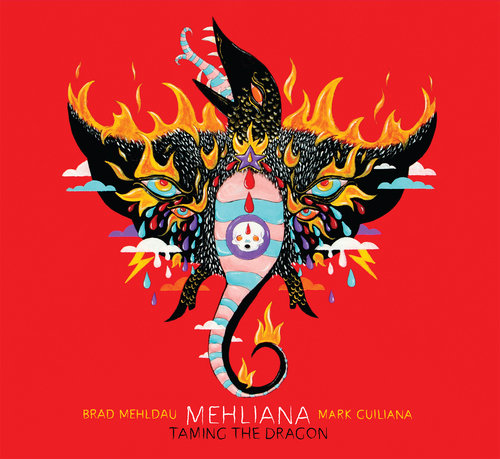 I first heard about master pianist Brad Mehldau’s new project months ago. A duo with drummer-percussionist Mark Guiliana wherein Brad largely eschews piano in favor of Rhodes and a variety of synthesizer set ups. The more traditionalist among you may already have been put off the album from this description, but to me this sounded absolutely fascinating. Brad is such a strong technician and usually approaches new projects with a such a complete vision for the final product that no matter how different, the results always seem to work. I went in to my first listen of his album Highway Rider, which at first I viewed as one of those jazz with strings gimmicks, expecting to hate it. Despite my best efforts, by the end of the album it had become one of my all time favorites, on the strength of beautiful long form compositions, well crafted orchestrations and fabulous playing from everyone involved. While I certainly hope he doesn’t abandon the tried and true trio, I see a new format like the one he has with Guiliana as a great opportunity. I was hooked. The undeniably grooving drums over which Mehldau has plenty of space to play. The fabulous sounding keys set up, with a beautiful Rhodes tone over a different synth bass line and that clever note holding synth setup sitting on top of the Rhodes. All sounds great. And then halfway through, the musicians switch roles, with Mehldau moving over to an acoustic piano and Guiliana starting up with the electronics. A suite. Finally the album has come and despite all the anticipation, it still manages to pack some surprises, although not all of them are good. For one thing, the album suffers from those albums-as-performance-art spoken interludes. The title track and another titled “The Dreamer” both have poetry performed specifically for the album, while another “Elegy for Amelia E.” has found fragments that sound like they’re from radio. The poetry in the title track, which is presented in relatively calm interludes between much more active, vocal-less playing, I actually enjoy despite myself, but the spliced in radio noise I enjoy significantly less. There is still plenty of high quality musicianship, in line with the teasers, and much of the sound I love. The album feels well put together, with a deep and balanced sound. The synths and Rhodes sound great. My favorite is the track “Hungry Ghost”, which grows into a synth solo over Brad’s fabulously active left-hand bass lines with exciting, kinetic drumming. And yet, I’m torn about this album and can’t feel almost a little bit let down. Partly it’s the spoken word, which often just feels gimmicky to me. Partly it’s how much the music feels compressed in the studio. That incredible 13 minute live “Just Call Me Nige” has shrunk to a bit less than six on the album and lost the wonderful acoustic second half. I would love to see a live follow up release, something on which Brad and Mark feel they have more room to explore. Then too, while most of the album sounds great and I love the electrified sound, the track “Gainsborough”, coincidentally the longest on the album, is, with it’s swimmy electric effects background voice, basically lounge music. Still, this is a fine album. I would feel lucky if every album disappointed like this. Rudy Royston has played on many fine albums, including with JD Allen, Dave Douglas and my favorite on Linda Oh’s 2012 album Initial Here. He has, however, waited until just recently to release his first album as leader, entitled 303. A septet of rising stars including Jon Irabagon on saxophone and Nir Felder on guitar, with the exception of one Radiohead song and one composition by Mozart, they play all original compositions by Royston, often to great effect. And Royston’s compositions are pretty great, and diverse. My personal favorite tracks are “Play On Words”, an uptempo romp over ever shifting drums and “Goodnight Kinyah”, a ballad paced waltz with a fabulously simple yet compelling bass line and drums backing. On the former track, the sometimes roiling drums are in constant dialogue with the soloists, while on the latter the simplicity of the song seems to give them space to move about. The compositions are well crafted and hit that sweet spot of being simultaneously idiomatically regular enough and unexpected enough to be striking listens without becoming overly difficult to parse. The end of “Goodnight Kinyah” is just one of the album’s little twists as it turns a little motif from the otherwise entirely pleasant song into a sort of atonal vamp. Then too I greatly enjoy the band. Jon Irabagon is, after all, a Thelonious Monk competition winner and it should be said that I enjoyed Nir Felder in this setting more than I did on his own recent release, a testament to the power of proper setting to emphasize native talents. If I have any real complaints, it is that I felt the album, perhaps in part because of the diversity of the music, was a bit uneven. At a little over an hour long, they easily could have a cut a track or two to create a tighter overall package. But, no matter. This is a sign of good things to come.